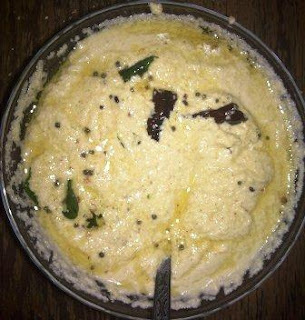 In a Mixer grinder add Grated coconut,Pottukadalai(Roasted gram), Green chilli, Garlic, Cashew nut, Salt and add little amount of water then grind it into a paste. Add the Curry leaves, Red chilli. Add this above in the grinded paste. This chutney goes with Dosa, Idly, and Chappathi.